One great childhood memory I have is going to Arby’s with my best friend and her dad in the winter. We’d go to Arby’s, get some yummy roast beef sandwiches, and go home and watch movies all afternoon. 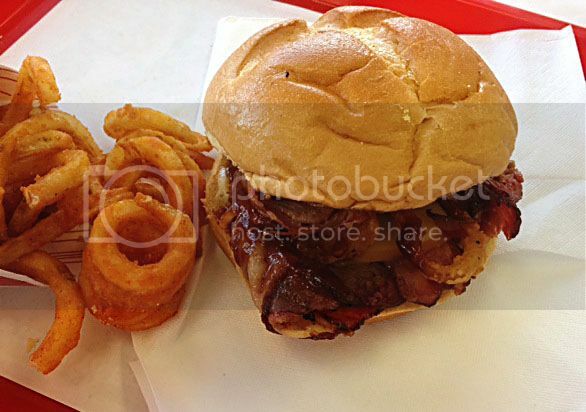 I hadn’t been to Arby’s in a long time, but I was recently curious about their new Smokehouse Brisket sandwich. I love slow smoked barbeque, so this sandwich looked yummy. I was excited when Arby’s came to me and offered me a chance to try the Smokehouse Brisket sandwich for myself! I took my kids to Arby’s one day during fall break for a fun lunch treat. We had just gone through IKEA so we were all starving for some good food. I got them the dollar menu roast beef sandwiches and some curly fries and ordered myself the Smokehouse Brisket. We had a great time! My kids were very entertained by the curly fries, “boing-ing’ them around like springs. And the Smokehouse Brisket sandwich? It was good. Great, actually. A little too much barbeque sauce for my taste, but the meat was very tender and yummy. The Smokehouse Brisket sandwich has beef brisket slow smoked for 13 hours, Gouda cheese, crispy onions, BBQ sauce with mayo, all on a bakery style bun. It’s really worth it. I found myself craving it just a couple days later when I saw the commercial on TV. I think my favorite part of the experience was just sitting in Arby’s and enjoying the time with my kids. They loved their food, they were happy, and I was happy. It was a beautiful fall day and I just created another memory with them that they will hopefully remember with fondness. Have you tried this sandwich yet? If not, go now and Find an Arby’s. Or you can just enter to win a $10 Arby’s gift card right here, right now. That’ll make your day, right? Make sure to watch the video, then leave a comment to tell me why you love Arby’s! I love Arby’s because I’ve never had anything there that I didn’t like. Their curly fries are great too! Arby’s is my go-to comfort food. Love the curly fries! All of us enjoy the curly fries! I love the curly fries and arby’s sauce. I love the curly fries, the arby’s sauce, and the memories I had of riding my bike to the local Arby’s when I was little. I love that Arby’s isn’t your typical greasy fast food. And those curly fries with a little Arby’s sauce to dip them in are phenomenal! My fav the curly fries! Love Arby’s thanks Heidi. I too love the curly fries, but I also love their milkshakes! Takes me back to high school every time I have one! I love Arbys! They have the best food in town. Everything from Roast beef sandwiches to curly fries to shakes. I love it all! I love that their food is always hot and fresh! I love their Beef and Cheddar!! Simply delicious! I love ARby’s jamocha shakes! I love Arby’s for their beef and cheddar sandwich. Something about that sweet sauce they put on those! So yummy! Love their beef sandwiches, and the curly fries! Arby’s Jalapeno Bites with bronco berry sauce are addictive! And I love their horsey sauce on a roast beef sandwich. I love their curly fries! Arby’s curly fries are just the best! I like Arby’s because I love their Roast Beef sandwiches. Don’t laugh …. I love their chicken sandwiches!! And you can’t have a sandwich without their curly fries & iced tea!